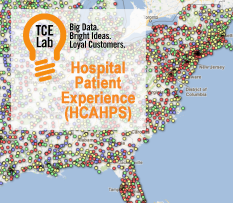 Big data provides big insights about U.S. hospitals as TCELab releases research analysis on HCAHPS patience experience surveys from 4,610 health care facilities nationwide. TCELab's research on 4,610 Hospitals using U.S. Gov't HCAHPS survey data. What really matters to patients? It's not what you think. Hospital improvement priorities do not seem to match up with what hospitals need to improve. TCELab, a thought leader in Big Data and Customer Experience Management (CEM), announced its research paper “Improving the Patience Experience” today based on HCAHPS data aggregated from over 2.8 million patient surveys in 4,610 health care facilities across the U.S.
Patience Experience (PX) has become a priority for U.S. Hospitals because the Centers for Medicare and Medicaid Services (CMS) will be using patient feedback about their care as part of their reimbursement plan for acute hospitals (Hospital Value-Based Purchasing VBP). Hospitals are focusing on improving the patient experience to ensure they receive the maximum of their incentive payments. The U.S. government releases data regarding the performance of different industries, including healthcare. Inspired by the Obama administration’s “Big Data Research and Development Initiative,” TCELab integrated six different big data sets on US hospitals, built predictive models of patient satisfaction ratings and documented the results into a free research paper. Dr. Bob Hayes, Ph.D., TCELab Chief Customer Officer, was the primary analyst on the research. The free research paper is available here: http://www.tcelab.com/hcahps. 1) A good patient experience does not start with medicare spending. The “Medicare Spending Beneficiary (MPSB)” assesses the cost of care by each hospital by the CMS. Dr. Hayes correlated MPSB with the patience experience survey data and found that hospitals with lower medical spend per patient are able to deliver a comparable patient experience to hospitals with greater medical spend per patient. 3) The biggest driver of patient advocacy is the patients’ perception of the quality of nurses’ communicaton effectiveness. 4) The quality of doctor communication is the second lowest driver of patient advocacy. Founded in early 2011, TCELab merges Big Data and Voice of Customer “VOC” metrics and applies predictive analytics to identify correlates of customer loyalty and sustained revenue growth; in other words “Create Brand Fans” and “Optimize ROI.” Based in Boston with offices in Seattle and Calgary, TCELab has 9 Business Intelligence solutions that include Research & Audit, Surveys & Driver Analysis for all business constiuencies (customer, employee, partner, end user, patient), as well as Linkage analysis & Predictive Analytics. Specifcally, PXM Audit and PXD target health care facilities. Founders Vishal Kumar, Stephen King, and Dr. Bob Hayes have a combined experience of more than 60 years of Customer Experience Management research, business strategy, and technical leadership.